Typically a Greek Style pizza uses toppings such as feta cheese, onions, Kalamata olives, spinach, tomatoes, capsicums and minced meat. A simple recipe like any other pizza types and here is my version. Now combine the rest of the ingredients for the crust but using only 1½ cup of flour with the yeast mixture. Mix with a spatula until it forms a batter. Place your toppings brushing the dough with olive initially, then with the tomato puree mix, sun dried tomatoes, onion, ham, feta cheese, mozzarella cheese and olives. Let it rest for 15 minutes. Pizza with healthier toppings? I’m in! Mmmm simple flavours make a delicious dish! 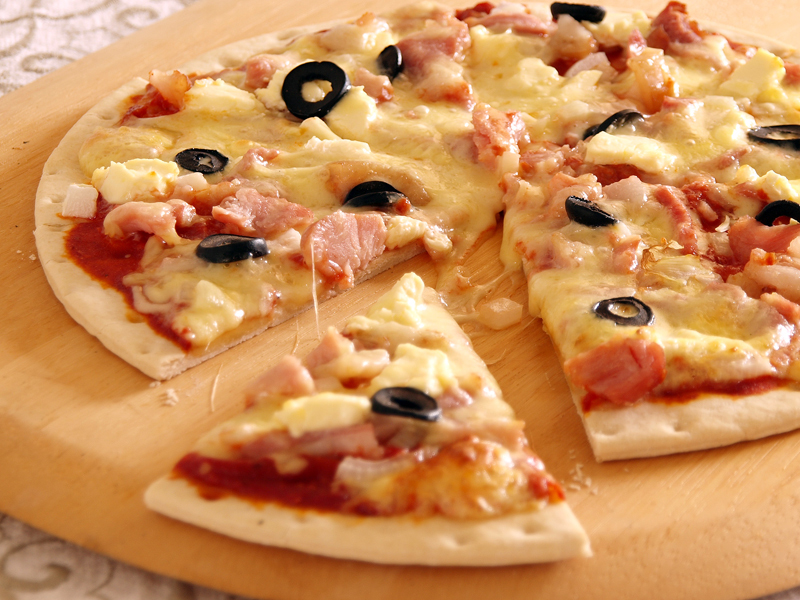 The pizza looks mouth-watering and lovely photo! I have been making my own pizza for a long time, and this recipe looks like one my kids would love. The combination between feta cheese and tomatoes is one of their favorites. I think all of your pizzas are terrific. I like the thin and crispy crust with the feta and tomatoes on this one. Good looking pizza there, Raymund! Love the sun dried tomato as part of the toppings. I’m making pizza tomorrow night and I’m going to try your crust and some of these toppings. I don’t have everything, but I do have many of the ingredients. This pizza looks great and all the taste combos that we love! Great pizza! Next time I won’t use pizza sauce anymore and use tomato paste + sun dried tomato oil and sun dried tomatoes. Great idea! Looks so delicious. My kids can eat pizza every week~~~! Thanks for defining a Greek pizza – I didn’t know some of that. What I do know is this looks like a wonderful recipe. Great toppings, and I love the idea of the sun dried tomatoes instead of a sauce. Really nice – thank you. This is a fast, easy week night meal for the whole family! Thanks for the idea!